EZ Pawn address, phone, website, hours of operation, and more. 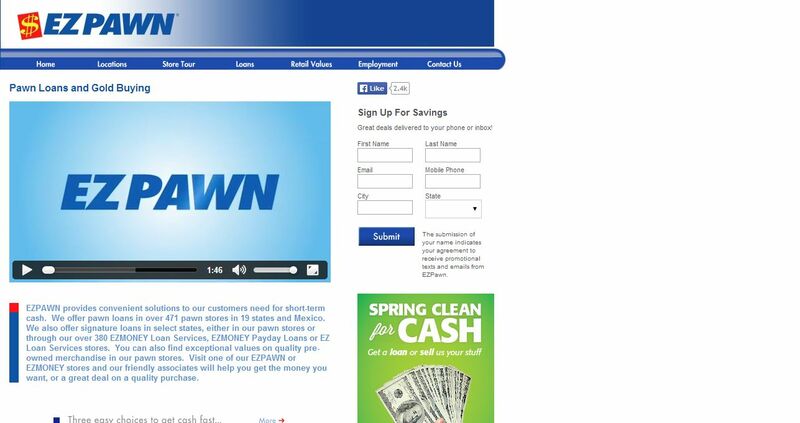 EZ Pawn provides convenient solutions to our customers need for short-term cash. We offer pawn loans in over 471 pawn stores in 19 states and Mexico. We also offer signature loans in select states, either in our pawn stores or through our over 380 EZMONEY Loan Services, EZMONEY Payday Loans or EZ Loan Services stores. You can also find exceptional values on quality pre-owned merchandise in our pawn stores. Visit one of our EZ Pawn or EZMONEY stores and our friendly associates will help you get the money you want, or a great deal on a quality purchase.